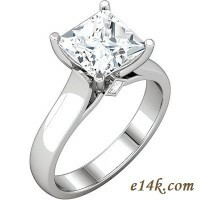 Princess cut Russian CZ in Solid 14K Gold 4-prong Solitaire Engagement Ring With accent side stones. Unbelievable Price!! This lovely item is pictured with a 3ct princess cut center stone and princes cut russian CZ side accent stones. Available in 14k White gold, 14k Yellow Gold, 14k Rose gold, and Platinum. This item is made-to-order and takes 7-14 days.